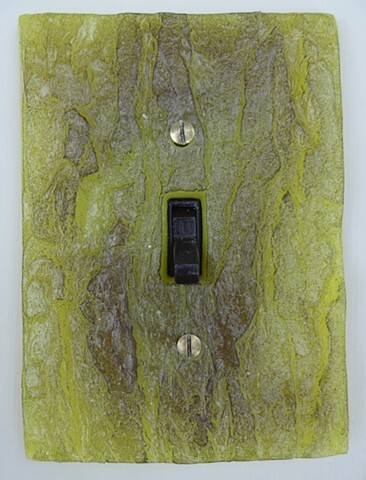 5 1/4" X 3 3/4" X 1/4"
This lightswitch cover fits to any standard socket. Colors include clear, black, purple, pink, blue, green, yellow and orange. The original mold was made with actual bark. Bronze powder and tint is mixed together in a liquid state. All are individually cast and very durable. Brass hardware is included and is easy to install. My square bark switchplates are available for purchase on my Etsy store. Please visit www.etsy.com and view my store, "DebSaw".